Nike makes shin guards for all types of players in every position, at any age, and soccerloco’s got them. We’re your premier destination online for Nike soccer shin guards and whatever other soccer gear you need because we have the largest selection and the best deals on the web. We have a range of Nike shin guards that feature excellent protective features to keep you playing and injury-free. All of our Nike youth shin guards come with built-in ankle protection to keep your young soccer star extra safe. Shop now and get your next Nike shin guard from soccerloco where you’ll get a deal on high-quality protection. The Nike shin guards we carry are made from solid materials and feature expert design and construction to shield you from harm season after season. Slip-in Nike soccer shin guards are excellent for attacking players who need minimal distractions while they put pressure on the opposition, and many of the models we carry come with compression sleeves to help them stay in place. We also have guard stays to keep your Nike shinguards in place if you prefer to play with shorter socks and need a minimal shield. The ankle guards attached to our Nike youth shin guards and some of our adult sized models are cut to accommodate cleats so they don’t hinder movement. No matter which shin guard you choose, you can be sure it’ll protect you. When you shop for your Nike shin guards at soccerloco, you’re sure to save yourself time and money. We have the largest selection of Nike guards for both adults and youth players at the best prices on the web. But we don’t stop there - as the leading online retailer of soccer gear, we bring you even more great deals. Flat-rate shipping anywhere in the continental United States means the low price you got on your Nike soccer shin guard will stay low. With simple returns, you can send back any of our Nike soccer shin guards with no fuss. 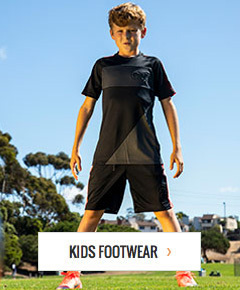 So shop today at soccerloco, the best place on the web for Nike youth soccer shin guards and everything else you need as a parent, player, coach, ref, or fan.